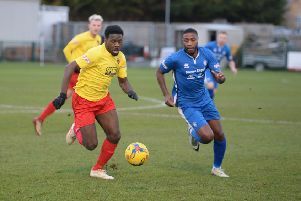 AFC Dunstable were narrowly beaten by Farnborough at the weekend, falling to a 2-1 defeat. The visitors were without influential defenders Danny Murphy (injury) and Bill Morgan (holiday), with Leon Cashman requiring stitches to play, while AFC then lost Terry Griffiths at half time due to a groin strain, with Kyran McGhan George injured in the pre-match warm up, hampering manager Steve Heath’s options. This disruption seem to affect AFC, as despite a good effort from James Bishop tipped over by Aaron Buffon. However, within 13 minutes they found themselves 2-0 down as on 10 minutes, Bishop pushed Nic Cardini in the box and Sam Pearce tucked the penalty away. AFC soon found themselves 2-0 down as from a corner, Pearce rose unchallenged to head home. Looking like it was going to be a long afternoon for the visitors, Heath’s side responded well, as Griffiths’ header crashed against the upright, the rebound cleared off the line by Ollie Treacher. On the half hour, Boro should have put the game to bed as a stunning pass from Denis Oli sent Sam Shaban clean through, but he somehow missed the target. Back came AFC though as from Newman Carney’s free kick, Cashman headed over unchallenged. With Griffiths having to be replaced by Brandon Carney at the break, AFC had to tweak their formation and came so close to pulling one back, Adiel Mannion’s effort was blocked on the line 10 minutes in. Boro then charged up the other end and as Cardini bore down on goal, Bishop was adjudged to have fouled him, only for Pearce to miss his hat-trick chance, blasting over from the spot. With 15 minutes to go, Joe Huggins struck the AFC bar, but five minutes later, BJ Christie’s superb 25-yard strike flew over Buffon to make it 2-1. Bishop picked up another yellow as AFC were reduced to 10 men, but they couldn’t summon up an equaliser, as Heath said: “While they probably deserved the points, I thought that comment they dominated the whole game was bit of an exaggeration. “We just did not settle in the opening exchanges and showed great character to fight back. AFC host Kempston Rovers on Boxing Day. AFC: Perks, Massay, N Carney, Griffiths (B Carney 45), Cashman, Bishop, Mannion, Olaleye, Christie, Humbert, Hall. Subs not used: Byron, McGhan-George, Hankins, Silvestri.